When May presented itself to me I thought we would at least have Spring by now. I think all this miserable weather should just stay away and give us some sunshine already. 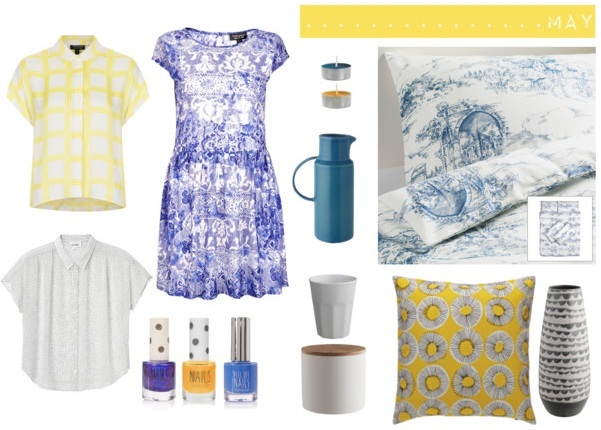 Until then, I have found some sunny summery delights that I would love to wear and dress my house up with. Notice a theme? I feel exactly the same about may. so disappointing! This wishlist is beautiful, however. I love the blue and yellow! The check shirt and daisy cushion are my favourites. I have the tumbler in pastel pinks and mint greens! Love them. I have a box sitting on my kitchen table, with your name on, that has a few unfinished bits and pieces. Whenever I try and finish, a certain little miss snatches the pen, scribbles everywhere and tears the paper! Expect some Lily contributions in your next post, that will be finished on my week off next week and posted to you asap! Eeee I cannot wait miss R! Oh notes and scribbles from little Lily! So exciting! I love the sunny yellow cushion too! I JUST bought the Emmie Land Quilt cover from Ikea last weekend. Perfect for the summer! I'm just loving it.